Honda barely pretended their 2013 Honda Accord Concept is anything but a minimally adorned version of the production car that'll debut and go on sale later this year. Like Ashley and Mary Kate Olsen, there are subtle differences, but so subtle you don't actually care. Speaking of subtle changes, there's not a lot to distinguish this latest-generation Accord from the outgoing one. There's a slightly more aggressive front clip and somewhat distinguishably different grille. The taillights wrap around into the body in a pleasing way. Maybe the Olsen twins are the wrong point of comparison. Maybe the new Accord is more like the Deschanels. The outgoing 8th-generation car is Emily and the new ninth-generation version is the slightly peppier, slightly more attractive, slightly lighter Zooey. The powertrains are also evolving, and at a pace that's less glacial than the styling. 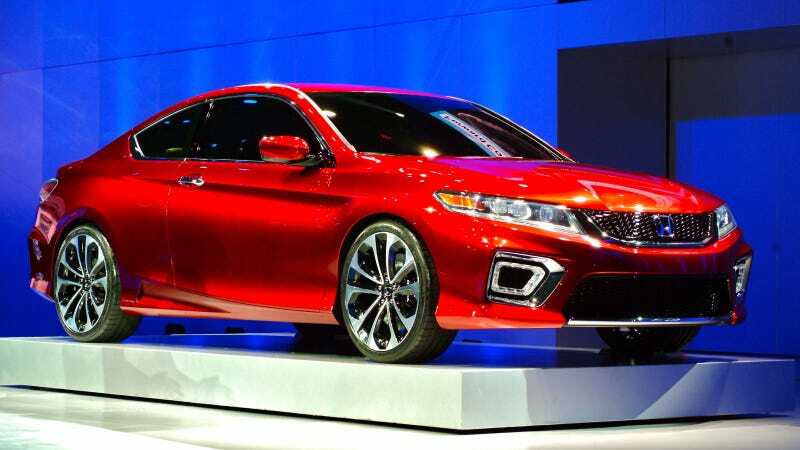 The next Accord will feature the new Earth Dreams 2.4-liter, 16-valve DOHC direct-injection four-cylinder, producing 181 horsepower and 177 lb-ft of torque while promising an increase in fuel economy. The 3.5-liter V6 returns with more power, as well. A plug-in hybrid system is also planned, albeit a less ambitious version than some of its rivals. It'll only propel you electric-only for 15 miles on a single four-hour charge, but they'll let you choose those 15 miles. Progress! What do you expect? In our sororal construct the Accord ain't never gonna be the Kardashians. Or even the Kardashians or Deschanels. The Accord lineup is the Gore sisters; you'd never fantasize about them but you wouldn't kick them out of your house, either.